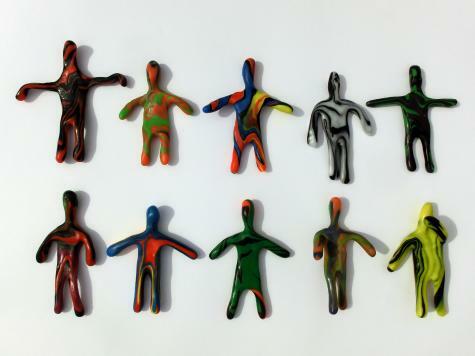 We used the Plastimake Colouring Kit to create a bunch of figurines with swirling marbled colours. Combine the three coloured balls into a single ball. Twist this ball of Plastimake in your hands a little so that the colours get some nice swirls. Don't mix it in too much or you'll end up with a brown blob! Stretch out the points of the star to form arms and legs. Drop your new figurine into cold water to stop it drooping and losing its shape! If you missed them the first time, be sure to check out our colourful Plastimake figurines as well as our original "Vanilla" figurines.